Bexhill United Football Club went top of the table following a good away victory on Saturday. 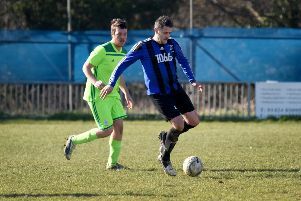 An early goal from Lewis McGuigan gave the Pirates a 1-0 win against a recently-strengthened Littlehampton Town team in Southern Combination League Division One. Bexhill manager Ryan Light said: “It (the result) felt like it had a bit of added weight to it. They had a new manager and they were loaded with well-known names from across the county scene, a lot of players who had won the top division. Jack McLean came through a fitness test on a sore foot just before kick-off, but Gordon Cuddington and Drew Greenall missed out through illness. John Masters led the side with Light away in London. Bexhill got off to the best possible start as central defender McGuigan rose unmarked at the far post to head his first goal of the season from a second minute corner. The visitors passed the ball very well and dominated possession during the first half. They could have added to their tally before the break, with chances falling to McLean and Wayne Giles. Littlehampton enjoyed a strong spell just before the break and Masters was pleased to get the players in to regroup slightly with the lead still in tact. The second half was fairly even, but Littlehampton certainly had their chances and Bexhill goalkeeper Dan Rose pulled off two fantastic saves, one of which was described as ‘unbelievable’, to keep his team ahead. Giles came off with around 20 minutes to go and with no recognised central striker at his disposal, Masters opted to play midfielder Liam Foster in a ‘false nine’ role, and Bexhill saw the game out quite comfortably. Left-back Nathan Lopez was Bexhill’s stand-out player by a distance. Although Bexhill’s free-scoring attacking form has inevitably caught people’s attention this season, they’ve now conceded just one goal in their last five games against team from their own division. “We’ve really shut up shop and that’s testament to Dan Rose, whose form has been consistently excellent,” added Light. Bexhill: Rose; Robertson, McGuigan, McFarlane, Lopez; Holden, J. Bunn, S. Bunn; Shonk, Giles (Foster), McLean (Gouet). Southern Combination League Division One top half standings (played-points): 1 BEXHILL UNITED 13-31 (+34 goal difference), 2 AFC Varndeanians 12-31 (+23), 2 3 Steyning Town 12-30 (+19), 4 Alfold 13-29 (+21), 5 Seaford Town 12-22 (+3), 6 Selsey 13-21 (+7), 7 Wick 11-21 (+5), 8 Hailsham Town 13-20 (+11), 9 Littlehampton Town 13-19 (-2).